Even before I found out about who Khost were, and wondered why and how they've managed to disgorge the divinely deranged document that is Corrosive Shroud, I could tell they were from Birmingham. They have that sense of music being crushed out of them that all the best heavy Brum bands have, that sense that they grew up under a car park, didn't see sunlight until they were well into their twenties, that same dazed, extreme feel of oppressive concrete overload that Sabbath and Godflesh and Nathrakh and Mistress had. Unlike those more deliberately insular and distilled entities though, Khost seem to be more genuinely apprehending and reflecting Brum's full diversity. Corrosive Shroud, in amidst its pulverising riffs and racket and giant humming undertow has weird whorls of exotica screaming though, a sense that Khost aren't interested in being part of any lineage, want to be a camera fixed on now. When you realise Andy Swan, co-founder of this duo (alongside Damian Bennett) is involved, things start falling into place. Swan was Justin Broadrick's prime synth & tape-based collaborator on pre-Godflesh projects Atrocity Exhibition, Smear Campaign and Final. Bennett played with 16/17 (their Kevin Martin-produced 'Gyatso' LP on Pathological is a massive unsung high-point in the whole God/Techno Animal/Ice strain of the mid-90s) and the incredible Gauge (whose 'The Gatehouse' is one of the most lost masterpieces of UK Louisville-style intrigue). 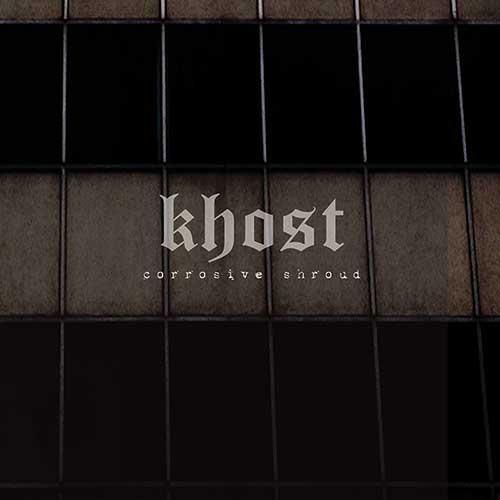 What they've created with Khost touches on all of that but you don't need to have heard their previous work to find delight, disturbance and drama throughout Corrosive Shroud. 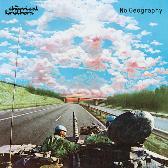 Another thing they recall is the pan-global bedlam inherent in the best work of Transglobal Underground and Fundamental – that feel which certain Nation Records artists had of letting the world in without measuredness or politeness, unleashing 'third-world' disorder into the strictures of Western sound until the barriers are broken and the brink is breached. On opener 'Avici' you can hear qawwalli wails smeared across the soundscape, like Khost are stumbling groggy from flyover to underpass through Sparkhill and Sparkbrook and Small Heath, pulling in the sounds from passing cars and shops and doorways. At the same time you could be on the other side of the world, on a death march where your destination is unknown, the only thing pushing your murderously exhausted frame onwards, the jab of a Kalashnikov in your spine. 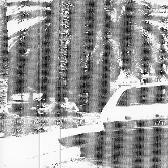 Khost, unlike so much music these days, HAVE to be from where they're from, but because they're from a fucked up and diverse place, their music has the ability to conjure similarly devastated environments wherever your imagination can stretch – on 'Revelations, Vultures, Jackals, Wolves' a Paul Bowles-style desert comes to life, thunking with slo-mo funcrushing beats but sounding ancient, pre-historical even though all is fuzz and samples and loops. 'Black Rope Hell' keeps the beats determinedly illbient and diseased and sets about destroying itself, the full-tilt slam absconding into moments of unholy feedback and drift. You find yourself as a listener unlocking new antechambers with each listen - at first contact, tracks like 'A Shadow On The Wind' and 'Bystander' seem like an intoxicating collage of the chaos we're in, but with repeated exposure, the further you fall in, the more you see them as analogous to a way wider environment than just Brum; a soundmap of a broken war-torn world as incisive and inclusive as Cabaret Voltaire at their socio-global sharpest. Corrosive Shroud is a political record: full of fearless post-punk spirit but refusing to pretend that the circumstances that pertained back then can pertain now. It knows the tower blocks are empty and survival and death is played out down at street level now. For all the bleakness and rage of its soundworld, it's a strangely hopeful document, because it suggests the miraculous idea that there's a new way of turning anger into energy, a new howl to make, new corners of the headspace to inhabit with sound and fury. One of the most pitiless-rackets of the year thus far. Let it splay you.